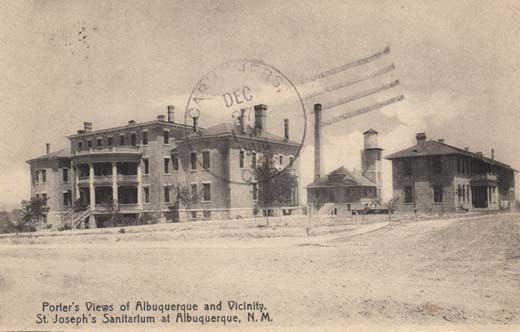 St. Joseph’s Sanitarium, Albuquerque, N. M.
Strong’s Book Store, Albuquerque, N.M.
St. Joseph’s Sanitarium at Albuquerque, N. M.
Methodist Deaconess Hospital, Albuquerque, N. Mex. 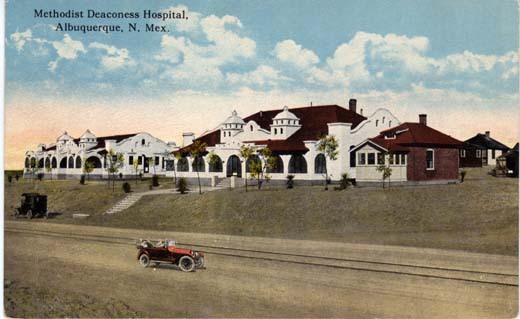 Methodist Deaconess Hospital, Albuquerque, N. Mex. ; The Methodist Hospital has accommodations for over fifty patients. (Tuberculosis only.) 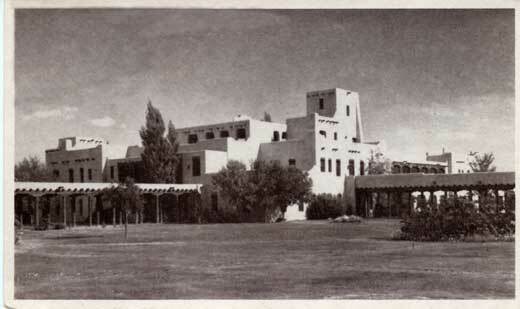 It is beautifully located on the Highlands near the University of New Mexico. 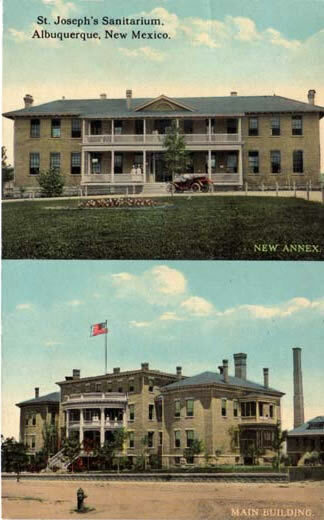 Hot and cold water with suites with private baths are features of the institution designed for the comfort of their patients. The Institution is open to all reputable practicing physicians. 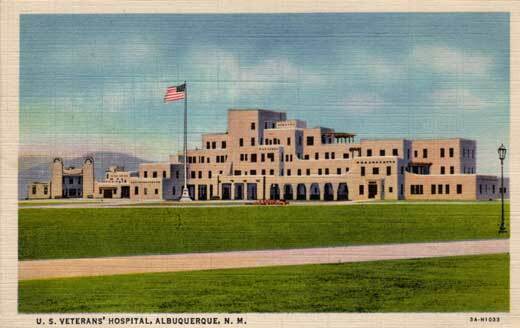 U.S. Veterans’ Hospital, Albuquerque, N.M.
One of the buildings of the United States Veterans’ Administration Hospital at Albuquerque, in typical Pueblo style, with beautifully landscaped grounds. This card printed for free distribution by the Albuquerque Civic Council, City Hall, Albuquerque, New Mexico. 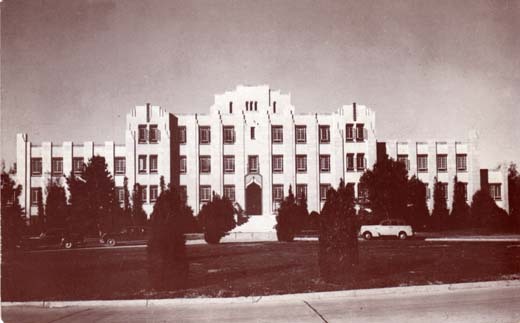 Albuquerque Civic Council, City Hall, Albuquerque, N.M.
U.S. Government Indian Hospital Albuquerque, N.M.
Indian Sanatorium, Albuquerque, N.M. 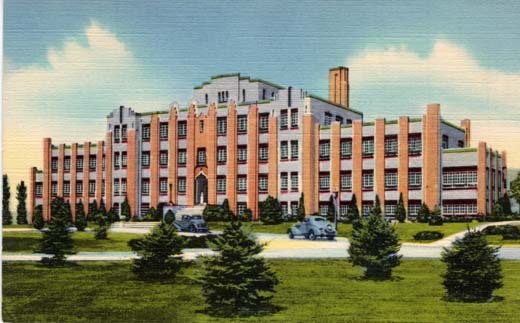 Constructed in 1934 by the Indian Service at a cost at $500,000. 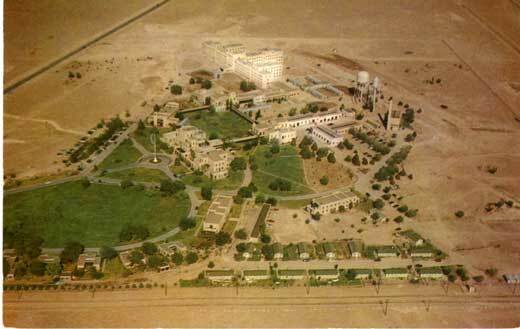 Administered by the United Pueblos Agency for Indian patients, composed principally of Southwestern Indians. 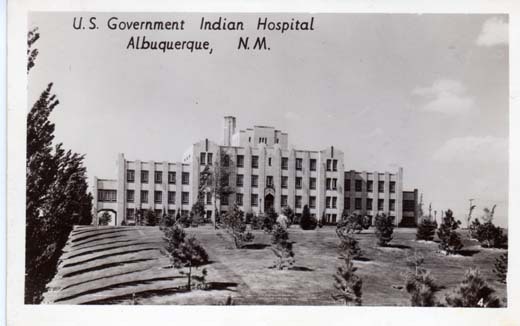 Pueblo and Navajo Indians are treated for Tuberculosis at no charge. Non-Indians are not admitted.